In this edited collection, authors from various academic, cultural, racial, linguistic, and personal backgrounds use critical discourse analysis as a conceptual framework and method to examine social inequities, identity issues, and linguistic discrimination faced by historically oppressed groups in schools and society. Language, Race, and Power in Schools unravels the ways and degrees to which these groups have faced and resisted oppression, and draws on critical discourse analysis to examine how multiple forms of oppression intersect. This volume interrogates areas of discrimination and injustice and discusses possibilities of developing coalitions and concerted efforts across the lines of diversity. 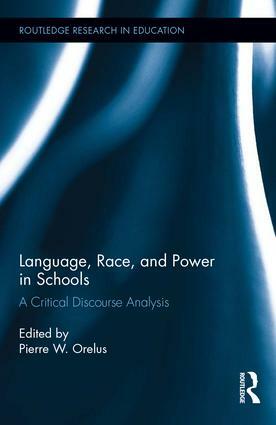 "Dear reader, let Pierre W. Orelus’ enticing edited collection, Language, Race, and Power in Schools: A Critical Discourse Analysis, be not just training for the mind, but an invitation for you to collect your thoughts, begin to build your own theories and coalitions, and prepare yourself for action and collaboration." "This book provides a multi-perspectival account of power, race, and discourse in educational contexts. Multilingual and multicultural scholars bring their lived experiences into dialogue with the conceptual, methodological, and interventionist tools of critical discourse analysis. The threads of continuity across the chapters will provide readers with the ideas, tools, and hope to intervene for social justice in educational institutions." Pierre W. Orelus is Associate Professor of Curriculum and Instruction, New Mexico State University, USA.